About: Dr. Meng’s teaching areas include public relations campaigns, research, PR leadership and ethics, and global PR. Her research focuses on leadership in public relations, measurement, trust, employee engagement, and reputation management. Dr. Meng founded and directs UGA’s ADPR Choose China study abroad program. Dr. Meng currently is the Executive Director of Choose China Training, Education and Outreach programs in Grady. 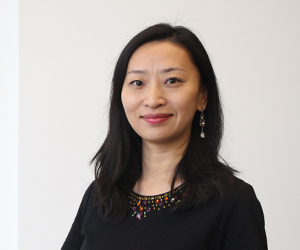 Dr. Meng’s current research focuses on leadership in public relations, talent management and leadership development, trust in reputation management, and organizational culture and employee engagement. Dr. Meng has received more than $220,000 in funding grants to support her research in the past seven years. She has published more than 35 referred journal articles in leading scholarly journals in public relations and communication management and contributed to different book chapters. Meng is the co-editor of the scholarly book, “Public Relations Leaders as Sensemakers: A Global Study of Leadership in Public Relations and Communication Management,” published by Routledge in 2014. Meng is currently working on her new original book project, “PR Women with Influence: Breaking through the Ethical and Leadership Challenges,” selected as part of the AEJMC-Peter Lang Scholarsourcing Series. Meng was elected to serve on the national board of advisors of the Plank Center for Leadership in Public Relations. She has collaborated with the Plank Center in the past ten years on various research projects, including the largest global study of PR leadership, Millennial Communication Professionals in the Workplace, the biennial Report Card on PR Leaders, and the North American Communication Monitor. Meng serves on the editorial review board for leading scholarly journals in the field, including Public Relations Review, Journal of Public Relations Research, International Journal of Strategic Communication, Public Relations Journal, and Journal of Promotion Management. Meng is a member of the Association for Education in Journalism and Mass Communication (AEJMC), the International Communication Association (ICA), and the Academy of Marketing Science (AMS). She also actively serve as reviewer for most leading communication, public relations, marketing, and management journals and conferences nationally and internationally. Meng is a member of the Association for Education in Journalism and Mass Communication (AEJMC), the International Communication Association (ICA), and the Academy of Marketing Science (AMS). She also serves on the editorial review board for the Journal of Public Relations Research and as reviewer for most leading communication, public relations, marketing, and management journals and conferences. Dr. Meng’s teaching areas include public relations campaigns, research, global PR, PR leadership and ethics. Dr. Meng founded and directs UGA’s ADPR Choose China study abroad program. She leads the program since 2014 and takes students to Shanghai, Beijing and Hong Kong to learning global advertising and public relations. To know more about the program, please visit the Choose China website. Prior to moving to the United States, she practiced communication in Shanghai for a few years, including being a journalist and editor at the Shanghai TV Network, correspondent in Xinhua News Agency (Shanghai Bureau), media relations specialist in Shanghai Media Group (SMG), and other strategic communication & marketing consulting service for various organizations. Before joining the faculty at Georgia, she was faculty at the University of Dayton and Oklahoma State University. Dr. Meng has received multiple awards for teaching and research in public relations, including the Wilcox Award for Best Teaching Paper from AEJMC, the Red Raider Award from the Institute for Public Relations (IPR), and several top research paper awards from AEJMC, ICA and IPR.